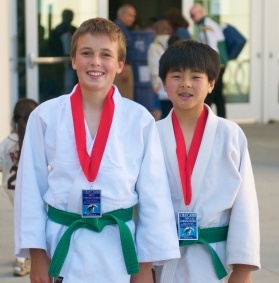 14 EBJI Students fought at the CA State Championships May 28-29 that were held at the City College of San Francisco. Dominic Ho, Nathan Ho, Cole Filson, Yuval Wolf, Jeff Fujimoto, Jared Beane, Keith Trader and Estefany Gonzalez all competed on the first day of competition, May 28th. Dominic, Jeff and Keith led the way for EBJI, taking gold medals in their respective divisions. All of them had impressive matches throughout the day. EBJI had other medalists the first day of competition, including Jard Beane who won silver. Cole Filson and Estefany Gonzalez also each won bronze medals for their efforts. Nathan Ho and Yuval Wolf both represented EBJI well and gained valuable competition experience. On the 29th, Satoshi Matsumoto, Masashi Matsumoto, Jackson Kim, Nathan Canadas, Nico Gonzalez and Brandon Izzo all competed. 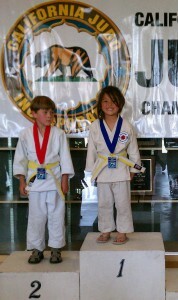 Jackson and Nathan both fought well and brought home silver medals for EBJI. Satoshi, Masashi, Nico and Brandon all won some matches, but were unable to reach the podium. All competitors represented EBJI with great sportsmanship and competition spirit.